This home was one of Middlefork's early accomplishments. 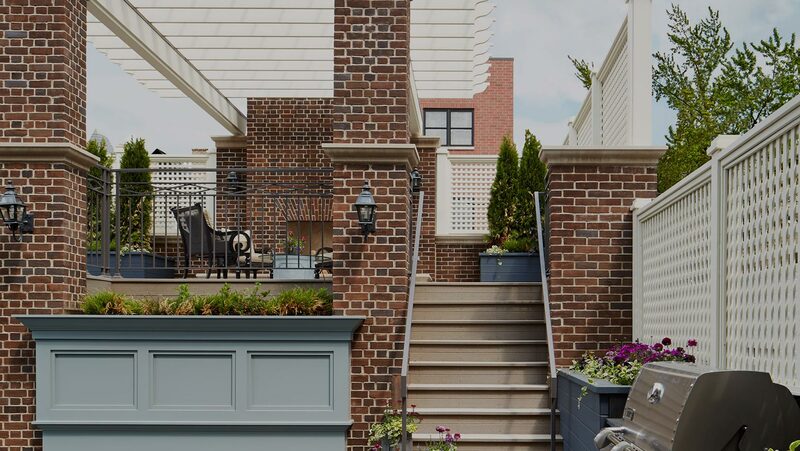 This home is on Fremont in Chicago's Lincoln Park neighborhood. Landscape irrigation is a watering system that many homeowners use to maintain lawns, gardens, and custom landscapes ensuring that water is spread regularly and evenly throughout any given landscape. Whether basic or high-tech, irrigation systems distribute the correct amounts of water in the right places and are essential to maintenance throughout the season. The type of system depends on a number of factors, like size of the lawn or garden, location, and the environment of the garden surroundings. It will also depend on the different types of plant life. So there are many different factors involved and different types of irrigation systems. These include drip systems, mobile systems (used on farms and large agricultural areas), overhead systems (most effective in nursery and greenhouses), and underground lawn irrigation systems. 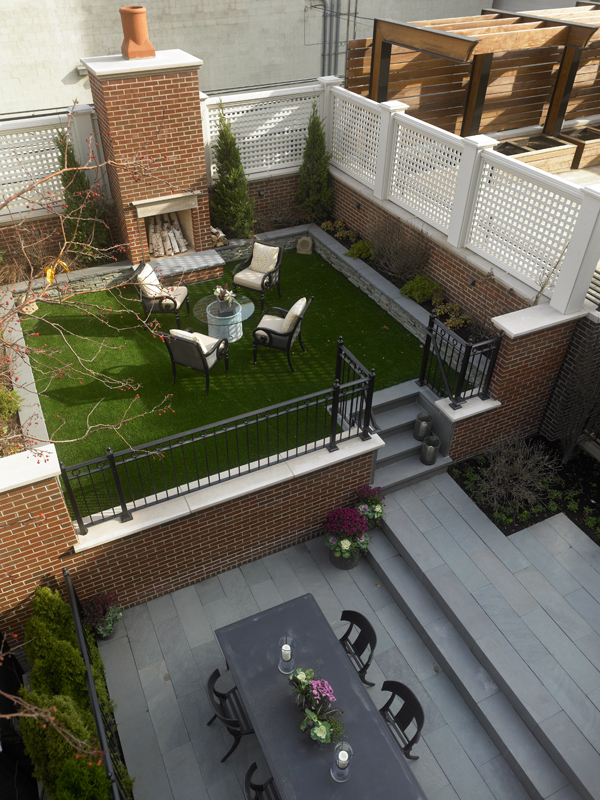 It is important to consult an expert when choosing what system will work best for your landscaping. 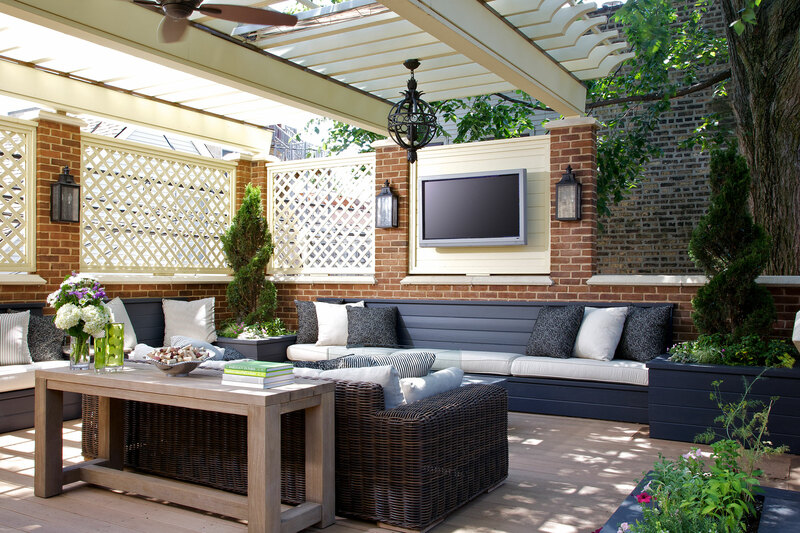 This backyard area offers premium entertainment space! Enjoy a fantastic dinner and move up a level to warm by the fire. With the addition of the fire place the life of your outdoor space is extended into the chilly spring and fall evenings. Drip systems are the most commonly used and preferred by city dwellers because they are appropriate for containers and garden beds. They are a simple, automated drip-irrigation system, which applies water slowly and directly to roots, frees you from hand-watering and helps regulate soil moisture. Plants respond by growing full and lush. And you’ll never have to drag around another hose or run back and forth with a watering can! Sports fans delight! Never miss a game or a beautiful day… This home is surely a favorite on game day. The overall look of you garden or “container garden” is highly personal and a variety of plants, flowers and vegetable can be grown in the city. Whether you ultimately decide to do it yourself or consult a professional create your wish list and give care and maintenance serious thought. The back deck or patio can serve multiple functions: areas for dining, relaxing, growing produce, and all using easy-care, low-water plants. 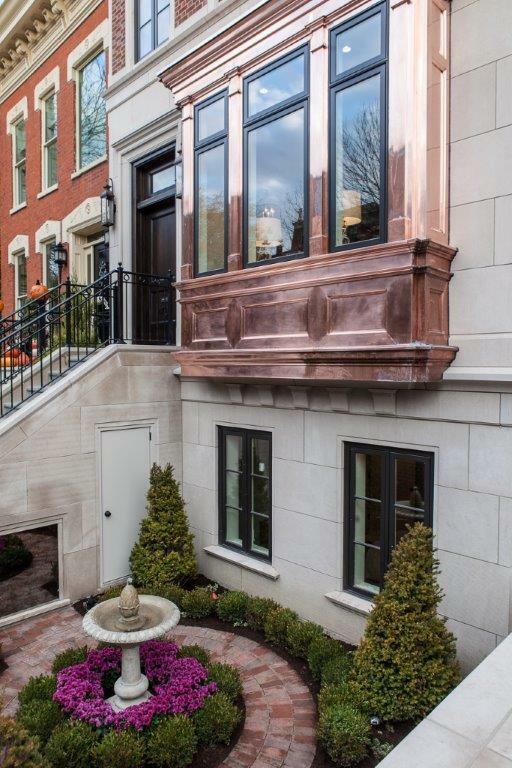 In many of our installations we have used a series of custom built planters and changes in elevation to create outdoor “rooms” and visual interest. This is sometime achieved with the warmth of a fireplace surrounded by large scale planters home to trees and shrubs or an outdoor structure like a pergola. The pergola can help provide shade for you and the vegetation you prefer. 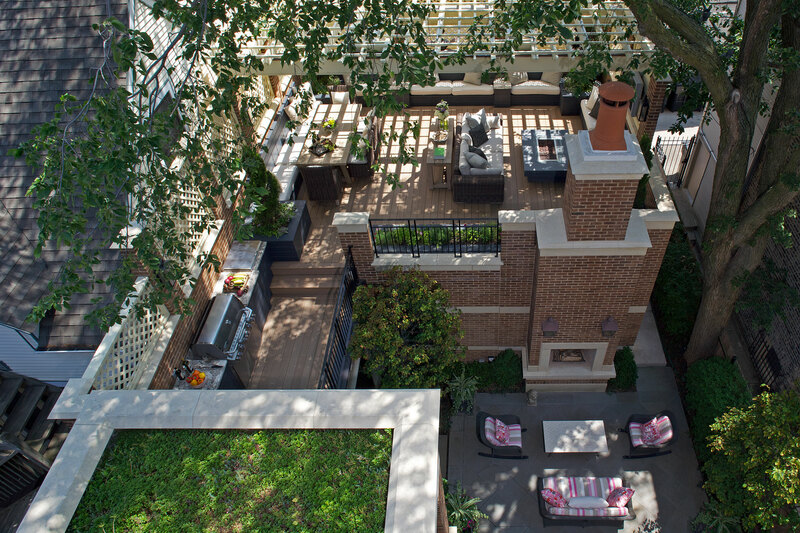 Farm fresh to table in the city equals – terrace to table. At Middlefork our landscape architect consultant is Stephen Prassas with Prassas Landscape Studio. Stephen has a Landscape Architecture degree from University of Illinois and started Prassas Landscape Studio in 2006. 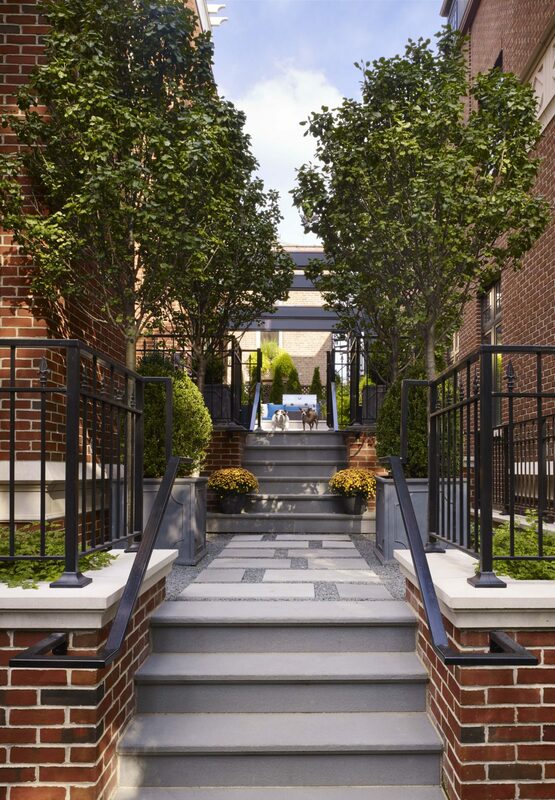 From private residences to public spaces – Stephen has worked with homeowners and architects. He has a practice dedicated to integrating sustainability and utilizes current technology and innovation. His projects with us have created unique spaces and have always integrated the homes architecture.